Tópico em '2017' criado por rapier em 09/03/2017, 23:41. Sinopse AniDB: With her mother dead and father long gone, Hatori Chise has spent her childhood being passed unwanted from relative to relative, until she finally makes her unfortunate way to a strange and improbable auction block. Offered as a sleigh beggy to the highest bidder, Chise is purchased by the (literally) boneheaded Elias Ainsworth, who promises to take her on as his apprentice. Elias is a mage, and his world is one of dragons and faeries - but before Chise can begin to get accustomed to all that nonsense, Elias drops another bombshell. 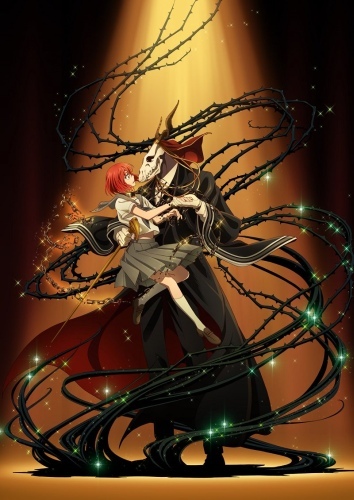 Apparently Chise isn't just intended to be his apprentice - she will also be his bride. Esse não é o mesmo trailer que soltaram pros OVAs?? (10/03/2017, 15:45)DeaththeKidd Escreveu: Esse não é o mesmo trailer que soltaram pros OVAs?? Não sei. Só sei que está marcado como trailer pro TV, logo é possível que o TV contenha os OVAs. Os cenários estão bonitos. É continuação do OVA? O OVA tá no meu PTW, vale a pena ver? (12/06/2017, 12:46)LiefGoku Escreveu: Os cenários estão bonitos. É continuação do OVA? O OVA tá no meu PTW, vale a pena ver? Entendi, acho que vou ver os dois então.